When you’ve finished your design (or if you’re not and you’d just like to see what it looks like in PDF format for easier viewing), click on the Finish button at the top of the screen to go through to Finish View. This is where you’ll enter the title of your project and your contact details so we know who it belongs to when it arrives at Momento. Note: If you are not yet a registered member, there is a link to the Register page on the Momento website. Finish View will also warn you if there are any issues with your file before you export it. If all is in order and you simply click the Export button to have the software create the Master File ready for you to send to Momento for printing. This is the name that will be used to identify your project once it is uploaded to Your Home on the Momento website. It is also the name that will appear on the spine of your dust-jacket or printed cover if you choose to print one. Note: If you entered spine text in Cover View you will notice that it already appears in the Project Title field. Changing this in Finish View will also change/override the existing text in Cover View. You can click on the + icon next to the warning text to expand the list and view each individual warning message. 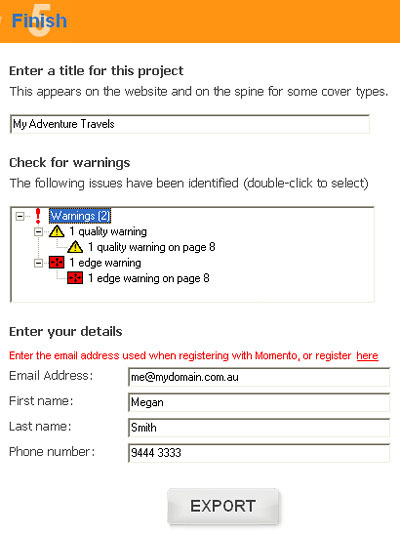 Double click on any warning to be automatically directed to the location in your book where the problem exists. From here you can fix the issue by resizing or repositioning your photo or by adding new pages. Note: You can disregard the prompt and continue to finish and export your project. An Edge Warning alert will pop up on the screen if you move a photo too close to any edge of the page or beyond the page edge. If you are comfortable that some part of the photo may be cut off the edge of the page during the production process, then you can safely ignore this warning. Otherwise you will need to reposition your image to fit within the Safe Area. When you move the image outside, beyond the page edge and the alert disappears, the software recognises this not as an error but that you have selected the Fit to Page or full bleed option. If your photo does not have enough resolution to be printed at the size you have selected a Quality Warning will appear. You should shrink or downsize the image until the warning disappears if you want the photo to print crisply. If you choose to keep the image as it is, we suggest you view your PDF Preview at at least 100% to ensure you are happy with the quality of the affected image before submitting for print. You also need to enter you contact details including the email address you used when registering with Momento. If you are not already registered there are links to register online before exporting your project. Note: Entering incorrect details can result in a delay in the production or delivery of your order. The export may take a while as it is dependent on the size of your photobook and the power of your computer. It generally takes a few minutes. You will be able to see the progress of the export on your screen. The files created during the export process will be take the name of the original filename (not the Project Title). The PREVIEW.pdf file is an important file for you to open and review thoroughly to ensure there are no design errors before you upload and order your file. See the PDF Preview page for full details. The Momento Book File is the working file you open in the Momento software to edit and add to your project. It contains all the file pathways that tell the software where to find your photos and what you have done to these photos within your project. Note: You do not send the MBK file to Momento for printing. The BAK file is a back up file that can be used should your MBK file become corrupt. If this occurs, please contact our friendly customer service team. We need to receive the Master File (MBF) in order to print your project. The Master File is created when you hit the export button in Finish View of the software. Despite the large image files you may have included in your project, Master Files are usually sized at approximately 500KB to 1MB per page with a successful export i.e. a 25 page Regular Book is 25MB. Note: The file is a proprietary locked file and can only be opened by Momento.